By his own telling, former Canadian prime minister Stephen Harper entered politics almost accidentally. He joined the Reform Party of Canada as a side project while pursuing his masters in economics; the man who would go on to be Canada's prime minister for more than nine years only stood for political office because his party simply was not fielding enough candidates. These outsider origins‚ as well as the populist bent of the Conservative Party of Canada he eventually led to a majority in Ottawa, explain Harper's unique ability to comment on the distinctly outsider-politics moment that much of the West is now going through. His new book, Right Here, Right Now, is an exploration of how the current populist wave came to be, and what conservatives of all nations can learn from it. 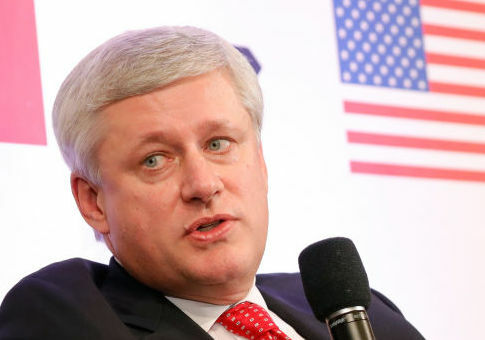 "My goal is to get the reader beyond the day-to-day machinations and reactions to Donald Trump in particular," Harper explained to the Free Beacon in an interview Friday. "To get beyond the personality of Trump. To get beyond the controversies and the day-to-day battles around the administration, and to focus the readers more on the big issues that have created the Trump presidency and are creating similar movements elsewhere." Taking that 40,000-foot view means understanding what prompted the populist backlash. That, in Harper's view, comes down to the increasingly alienating politics and policies of the international center-left. In Harper's view, the liberal establishment has taken advantage of globalization to divide the world up into "somewheres"—who embrace their particular families, communities, and nations—and "anywheres," the Davoisie who belittle the majority of the people as "fringe" or "extreme" or "deplorable." The predominant, elite culture of "corporatism, elitism, cultural relativism, and alienism," as Harper put it, cannot help but eventually prompt a backlash. "When 10, 20, 45, 50 percent of the people are saying that they're looking at new options, it's just not good enough to dismiss them as fringe and extreme or as ‘deplorable,'" he said. Harper is the sitting chairman of the International Democrat Union, the consortium of center-right political parties to which his own Conservative Party of Canada and the Republican Party both belong. As such, he has a particular interest in how conservatives of all stripes cope with the populist turn, in America and beyond. Here, he has skeptical words for those conservatives who have "taken a fixed set of policy prescriptions from the 1970s and 1980s, and they've become kind of a doctrinaire conservatism not really focused on the needs of ordinary people and the challenges they presently face." Right Here, Right Now contrasts this rigid, dogmatic conservatism with the views of conservative idols like Ronald Reagan and Margaret Thatcher—leaders who shared commitments to free markets, liberal democracy, traditional family, and a robust foreign policy, but who professed these views as a matter of what was best for their people, not as a dogmatism. Harper's conservatism is of the Burkean variety, committed as much to caution and prudence as it is to sweeping ideological pronouncement. In the prime minister's view, this rigidity was what helped sink all of Donald Trump's contenders in the 2016 Republican primary. "Donald Trump stood on a stage against 16 other candidates who were what would be called for the most part very traditional conservatives, saying almost entirely the same thing about policy and issues, and he kicked their asses. And he kicked their asses with conservative voters," Harper said. It is this conservatism, committed to the same fundamental beliefs, but also to serving the "somewheres," that Harper thinks could have real winning potential—assuming, that is, that conservative leaders stick by it. His analysis of U.S. politics suggests that it explains not only the rise of Donald Trump, but also the dozens of state-houses and legislatures the GOP now holds. Harper's goal in Right Here, Right Now, then, is to outline a political program that is still "pro-market, pro-trade, pro-globalization, and pro-immigration at heart," but which also adapts itself to the needs and demands of the "somewheres" who feel left behind by the 21st century. That includes a more cautious trade policy, as well as an immigration policy which looks like Canada's much-vaunted merit-based system. The Canadian system works, in Harper's words, because it is focused on legal immigration, prioritizes the economic needs of the receiving nation, and because its leaders refuse to lie about any problems that the immigration system might import. This looks very much like the policy that the Trump administration has put into words, if not yet into action. Many pundits—left and right—have bemoaned the rise of the populist wave. But for Harper, it is vitally important for political leaders to stop, listen, and learn. "I'm a big admirer and friend of the United States, and I think as the United States goes, so does so much of the democratic world," Harper said. "I really think that there's an opportunity in the United States to learn in a way from the rise of Trump, and the rise of populism, that I think conservatives everywhere could benefit."